Orange Is The New Black has a lot to answer for. The end of season five left us reeling with almost too many emotions to process and no idea what would happen next. 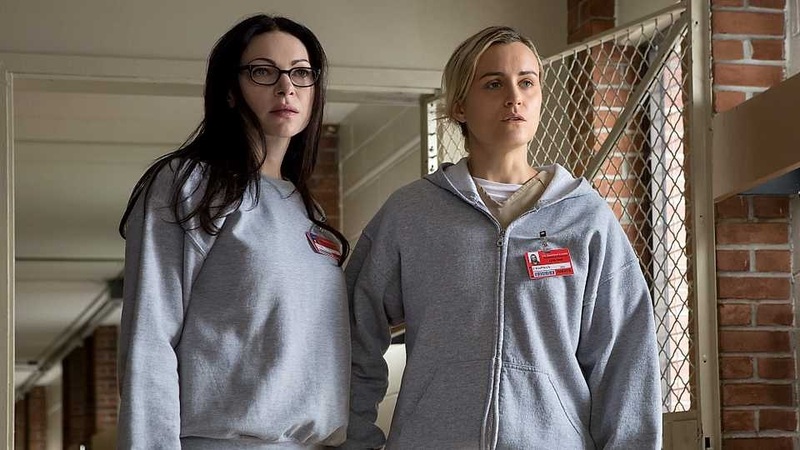 But with season 6 of the Netflix series confirmed and a release date on the horizon, there is one thing we do know: we're entering a post-Litchfield world and things look very different. We left the last season in the aftermath of the lengthly riot that saw many of the prisoners being shipped off to a new location when guards eventually re-seise control. Inmates Alex, Piper, Taystee, Big Red, Gloria, Frieda, Nicky, Suzanne, Cindy and Blanka (so, the majority of the remaining lead characters) managed to avoid the mass relocation and hid in the prison bunker, but their time there was inevitably limited. With little indication of what would happen to them, we're pretty much left in the dark about where the story progress, until now. We have a feeling that some unresolved karma and consequence is going to come around this year. Two prison guards - Humphrey and Piscattella - were killed last season, factions formed, friendships were made (and broke) and no doubt someone will have to pay for all of the different layers of drama that ensued. For those of you who weren't too sure about the thirteen episodes of a three day riot set up the production team went with last year, don't worry, season 6 will likely be very different. Co-producer Tara Herrmann told The New Yorker: 'We had lost a bunch of the original writers. It wasn't anyone's fault. It was just a new dynamic - people were attached to the characters as viewers, not as creators'. Only two writers from last season continued on to work on season 6, so expect a shift in tone and direction this time around. An updated version of the opening credits was released giving us a sneak peak at what we can assume will be the inside of on of the prisons the Lichfield inmates have been taken too. A Twitter user did us all the favour of screenshoting some of the new interior and we're both nervous and eager to see how it's going to pan out - needless to say, those shackles don't look promising. The Orange Is The New Black Twitter account shared an ominous teaser for the upcoming season. We see a prison canteen filling with orange smoke and yep, that's the infamous chicken perching in the window. The full trailer offers much more to speculate over. We see our original inmates thrown into the depths of Litchfield Maximum Security prison where in-fighting is high on the agenda. There's an investigation into the deaths of the two prison guards, Suzanne is struggling to adapt to the new environment without any allies and there's no sign of Alex Voss... yet. Watch the full trailer below. What will the new Orange Is The New Black prison look like? In true social media brillance, fan accounts have been tweeting images spotted in the new teaser trailer and first looks at the unnamed location for the next installment. When is Orange Is The New Black Season 6 on Netflix? Not long to wait now. It's finally been announced that the new season will be hitting our screens on 27 July 2018. Mark the date in your diary because we have a feeling this is going to be a back-to-back viewing scenario. We're already two seasons in to this series and if you haven't caught up yet, it might be time to schedule you're next Netflix binge. To bring you up to speed: You Me Her is about a throuple. Not a couple, there's three of them in a relationship and the series follows the highs and lows of their trying to navigate this version of polygamy with all of the usual tropes of your favourite romance-orientated American sitcoms. If you've been missing a dose of Mindy Kaling from your television schedule she's back in all of her comedic glory. Champions sees Mindy reunite with a high school fling and introducing him to their 15-year-old son, Michael (who will win you over almost immediately). Sure, the plot line might not be revolutionary, but it makes for an easy, funny watch. The Fab Five are back way sooner than any of us could have dreamed! The revival of the noughties make-over franchise quickly came to define our 2018 and season 2 is undoubtedly at the top of many a watch list. Another month, another Netflix documentary to fuel office chit chat for a good few days. The Staircase tells the story of crime novelist Michael Peterson, who was charged and convicted of the murder of his wife Kathleen. The docu-series originally aired back in 2004, and this new installment will include the original episodes alongside new revelations about what happened ahead of Peterson's conviction. A fierce and fascinating look into international icon Grace Jones' life is making it's way to Netflix. Unlike many documentaries about the famous women of our time, the focus isn't tragedy but rather an energetic and poignant making of Grace's life and career. Planet Earth II needs no introduction, just rest assured that you'll have access to the soothing sounds of David Attenborough's voice against the chirps, coos and mating calls of the animal kingdom on demand very soon. In amongst the boozy brunches, lazy afternoon picnics and weather-dependent BBQs, you're going to want some serious down time. The type of down time that calls for a vaguely familiar storyline retold by four funny female Hollywood stars. Here's the answer to your call.